This is my first galette EVER! For some reason, I’ve always had a fear of galettes. While they seemed like a very rustic kind of dessert, at the same time, they also seemed very fancy and sophisticated. I thought galettes were difficult to make… until just a couple of days ago. I made this Guilt-Free Cranberry Galette and could NOT be any more shocked. Why was I so nervous about making a galette? This is literally the easiest, quickest, and laziest recipe, but at the same time, totally elegant and fancy too. This post was sponsored by Immaculate Baking Co. All opinions are mine and mine alone. Thanks for supporting the brands that keep Desserts With Benefits going! But really now, what about the taste? THE TASTE, my friends, THE TASTE. 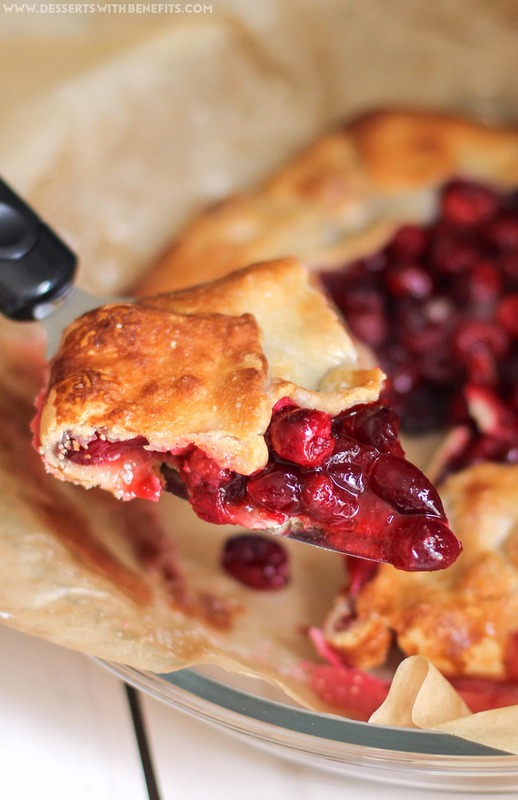 The flavor of this Cranberry Galette is ON POINT. It is of epic epicness. At first bite, you get sweetness. Then a subtle tartness rolls in from the cranberries. The crust is both rich and flaky. Together, they pair in the best way possible. I was never a fan of cranberries until two days ago. Now, I’m obsessed. I ate two slices of this galette immediately after slicing it. I had to stop myself because my mother requested a cranberry dessert for a little get together she was having, so I had to save some for her. Ugh. I seriously wanted more! Traditional galettes are made with pastry dough filled with butter and bleached all-purpose flour. And the fillings are usually chock full of white sugar and even more butter. But not this bad (or good?) boy right here! 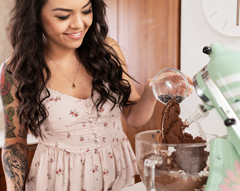 Immaculate Baking Co.’s mission is to create delicious baked goods, so they’ve created an extensive line of wholesome baking products (which includes certified gluten-free and organic goodies so everyone can enjoy dessert). I can’t wait to experiment some more with these guilt-free, ready-to-bake pie crusts! 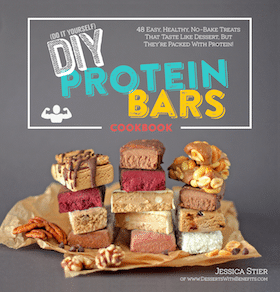 I’m thinking Healthy Homemade Toaster Strudels, French Silk Pie (and Nutella Pie — genius idea by Marina @ A Dancer’s Live-It! ), Healthy Apple Pie, etc. etc. etc. I could go on foreverrrrr. This Cranberry Galette is ON POINT! At first bite, you get sweetness. Then a subtle tartness rolls in from the cranberries. The crust is both rich and flaky. Together, they pair in the best way possible. Bring the rolled pie crust out of the fridge and let it sit at room temp for about 20 minutes, or until soft (if you unroll it cold, it might tear). Unroll the pie crust on top of the parchment lined baking sheet. In a large bowl, stir together the cranberries, orange flavor, stevia extract, and vanilla paste. In a small bowl, whisk together the erythritol and cloves. Dump this over the cranberries and stir together. 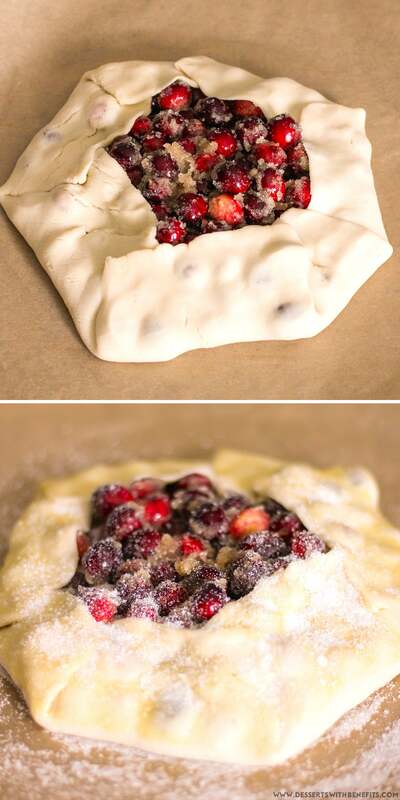 Scoop the mixture into the center of the pie crust and fold the dough over to create a galette. In a tiny bowl, whisk together the egg yolk and water. 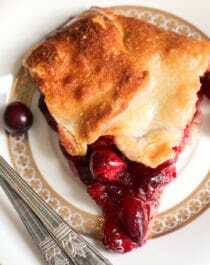 Brush this over the pie crust (you won't need to use all of it... you'll probably end up using about half) and sprinkle on the remaining erythritol. Bake for ~30 minutes, or until the pie crust is a lovely golden brown. Let cool, then slice and serve! YES. Just 140 calories and 2g of sugar for a generous slice of this amazing galette! I sure don’t feel bad about having an extra slice. If you want an even more decadent treat, simply top your slice with all-natural whipped cream or Homemade Vanilla Fro Yo. This is literally the easiest, quickest, and laziest recipe I have ever made. 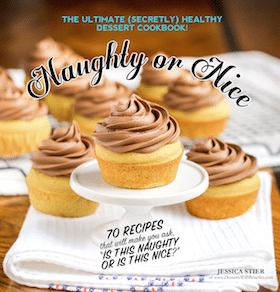 This is the perfect Thanksgiving treat to bring over to a potluck, gift to a friend, or bake just for yourself. Hope you enjoy this Guilt-Free Cranberry Galette just as much as my mom and her friends (and I) did! I LOVE how galettes are sophisticated and rustic at the same time. And delicious! Thanks for the great recipe. oh come on food blogger – this doesn’t count as you FIRST galette 😉 you used store-bought pie crust 😉 it looks great though – a great option for when you’re in a pinch – especially since Thanksgiving is coming up for you guys!